One of my cooking goals this year was to cook more fish. And not just shrimp and shellfish, but actual scales and fins fish. You’d have to be living under a rock to not hear all the health benefits of a fishy diet, but it is one of those (admittedly few) remaining things that completely intimidates me in the kitchen. So this recipe, from the September 2009 issue of Food and Wine, was a good start for me. The recipe itself is so easy and fantastically delicious it’s embarrassing how long it’s taken me to make fish. You just stuff it with lemons and goodness and grill. But buying the fish and coming face to face (literally) with them was another story. 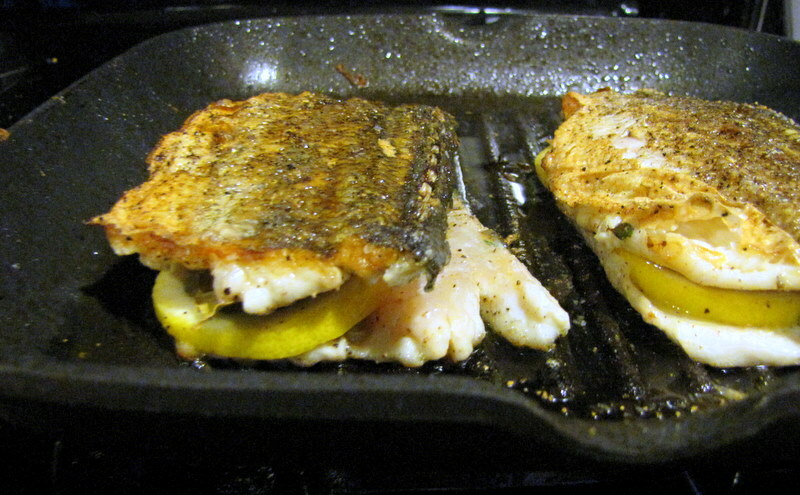 I had no idea how to respond when the fishmonger asked “How’d you like these?” when I bought the 2 whole branzino. I told him what I was doing to them, and he scaled and gutted them for me. Lesson learned, now I won’t seem like such a rookie next time. But then when I opened the fish package at home and they were still in possession of their heads and tails, I didn’t think this dinner would happen. Adam actually walked in on me squeezing my eyes closed and attempting to blindly hack the heads off with a large kitchen knife. Not my finest hour. I just couldn’t get past the glass-eyed fish expressions. Adam took pity on me and dealt with the heads. I was brave enough to deal with the tails, and from then on it was just like any other piece of meat to cook. But I have now learned to be more specific with the fish guy, because heads=no dinner. Apparently I need to be able to pretend that meat came from a tree or a stork or something, not a creature with a head. Sometimes I think I am the worst carnivore ever. Anyway, this is fast and awesomely good. I made some orzo and peas to go with it. The whole recipe is below, but I halved it for the 2 of us. Light a grill or preheat a grill pan. 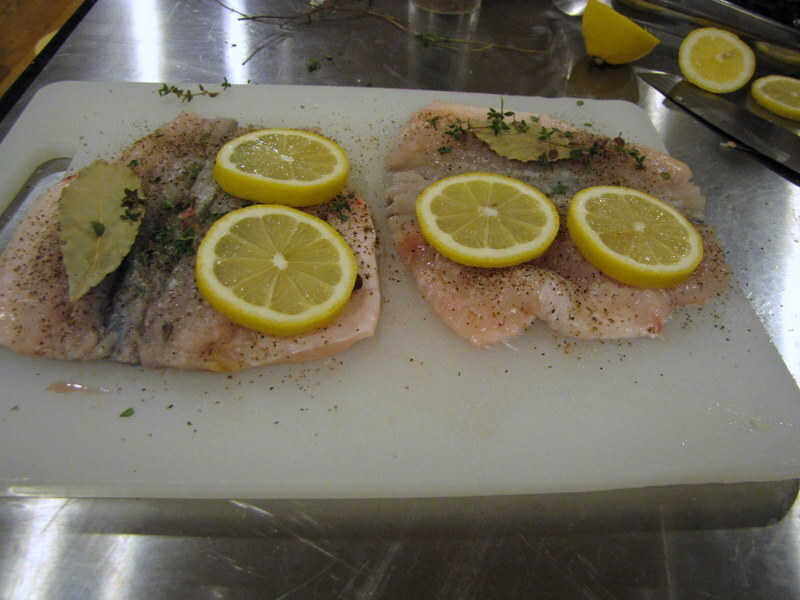 Season the fish cavities with salt and pepper. Stuff each cavity with a thyme sprig, a bay leaf and 2 lemon slices. 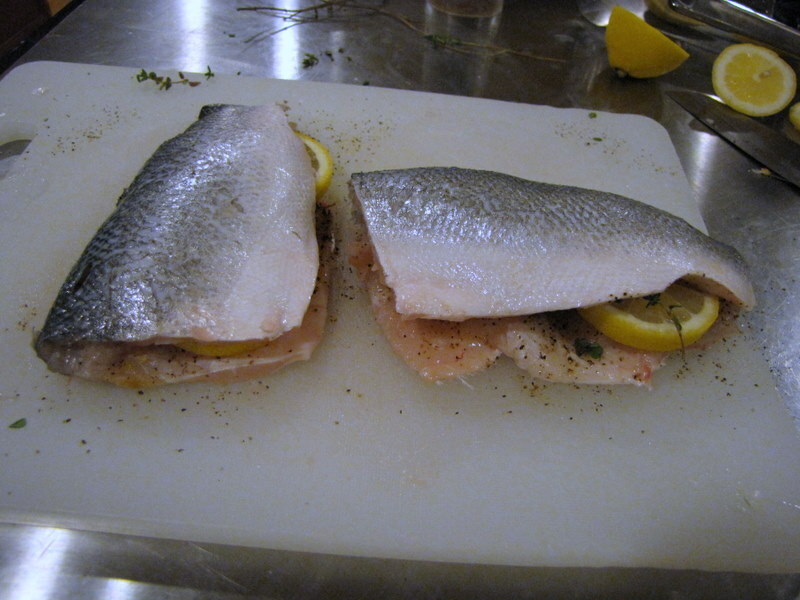 Rub the outside of the branzino with the olive oil and season with salt and pepper.